The scenario sounded frighteningly real. 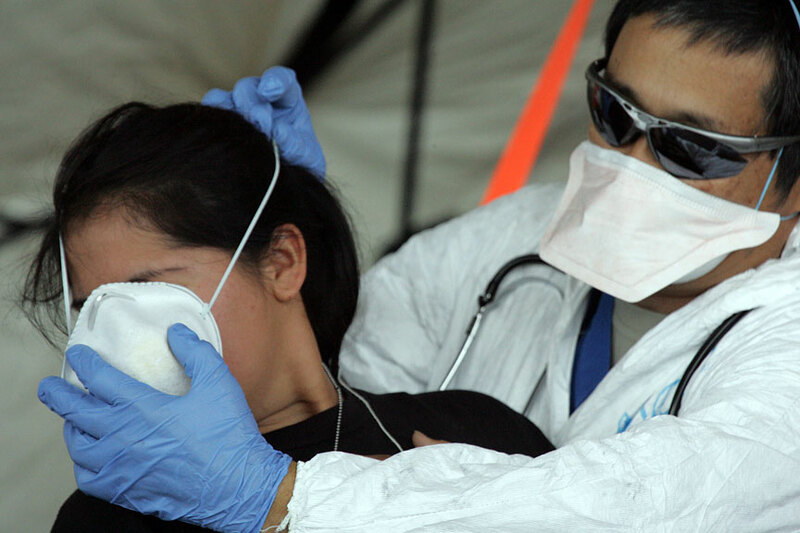 More than 200 federal, military, state and county medical and emergency specialists were called into action yesterday when the possibility arose that passengers from a commercial 767 jet that crashed on Midway Island might be affected with the deadly avian flu. Coast Guard C-130 cargo planes with Air Force and medical specialists from Tripler Army Medical Center were sent to Midway earlier in the week to treat the nearly 200 passengers from Jakarta, Indonesia, who were on the commercial aircraft when one of its engines was struck by a bird. In the process of transferring the injured passengers -- most of whom could not speak English -- some of them started showing flulike symptoms: high fever, diarrhea and coughing. Federal regulations required the C-130 crew to report the illness, which was relayed to the Communicable Disease Center. Immediately, a "safe haven" quarantine, decontamination station and mobile hospital were established at an abandoned hangar at the John Rogers Air Field at Kalaeloa. The hangar had already been designated as the triage site to receive the mass casualties from the Midway Island plane crash. When the Coast Guard C-130 landed yesterday at Kalaeloa, U.S. Customs and Border Patrol agents sealed off the area. Later, the agents, wearing goggles and nose and mouth face masks, stood guard as nine patients on litters, two dogs and one blind person with her seeing-eye dog were processed and sent to a quarantine area or to the hospital. The team of 50 Air Force and Army medical specialists, who, under the disaster scenario, were returning to Oahu after helping at the crash site, also were taken to the quarantine station because of the possibility that they had been infected. Yesterday's drill was designed to help federal, state and county officials test a system for managing patients during a mass casualty situation, explained Lt. Col. Stanley "Ed" Toy, chief of operations for the U.S. Army Pacific's Joint Task Force-Homeland Defense headquartered at Fort Shafter. In this case the treatment of the "crash victims" was complicated by the possibility of a pandemic influenza outbreak, Toy added. "The intent here is to safeguard the community and the state of Hawaii from any infectious disease threat." Toby Clairmont, leader of the Disaster Medical Assistance Team, told reporters, "We want to stress the system." "A large part of this exercise is learning to work together ... to be as seamless as possible." Toy said planning for exercise "Lightning Rescue" started more than a year ago. If this had been an actual bird-flu threat, the entire mobile operation probably would have been set up at Honolulu Airport, which already has an area designated to handle this type of emergency, Toy said. Besides treating the three animals, which actually were stuffed dogs, yesterday's exercise involved transporting three patients encapsulated in a plastic "biocontainment chamber."